When it comes to choosing heating equipment for your facility, there are lots of options out there to explore. Even once you’ve narrowed your choices and have opted to go with a thermal fluid heater, you still have a handful of factors to consider as you select the equipment that’s best for your facility. One of those factors is whether or not to invest in an API-style thermal fluid heater. What Is An API Thermal Fluid Heater? API thermal fluid heaters are industrial heaters that are built to meet rigorous API specifications. These specifications are recommended practices provided by the American Petroleum Institute, and are intended to promote safety in the oil and natural gas industries. Many of these specifications have been incorporated into state and federal standards for industrial heating equipment as well. You can learn more about the details of API specifications and why they are so important here. 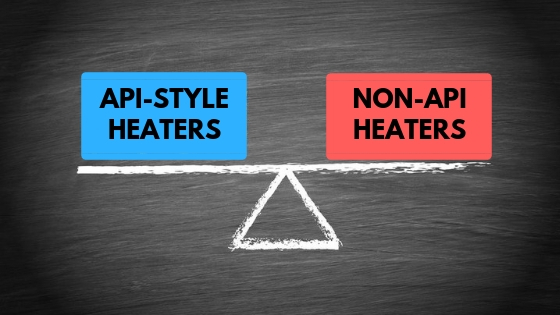 As you’re deliberating between API and non-API heater options, there are a number of comparisons you’ll likely take into account. Here, we’ll break down the similarities and differences in a variety of categories so you can gain a more holistic understanding of how the two heater types compare. API-style heaters utilize serpentine coil technology, which provide a myriad of benefits, including increased efficiency, lower levels of fluid degradation, higher operating temperatures, longer tube life, and easier maintenance. Non-API heaters are typically made with helical coils. This coil type offers a reduced radiant surface area, which can result in higher flux rates, higher film temperatures and decreased efficiency when compared to their serpentine coil counterparts. API thermal fluid heaters are typically custom designed, meaning their designs can be altered to suit the application they will be used for, as well as the specific needs of your facility. This means your API-style heater will be an efficient heating solution that meets the exact specifications you’ve outlined. Non-API helical coil thermal fluid heaters are often standardized, mass-produced and ready-made. This means they come in standard sizes and styles, and are typically designed to function in a variety of capacities rather than being customized for one specific application. Both API-style thermal fluid heaters and non-API thermal fluid heaters come in a variety of configurations and can be used for a number of different applications in various industries. The main difference here is that API-style heaters offer more opportunity for customization to accommodate your facility’s specific needs, whereas non-API heaters offer standard designs and configurations that may or may work when it comes to your specific application and facility layout. Because serpentine coils are a bit more flexible and versatile in terms of layout, API-style thermal fluid heaters tend to offer more options when it comes to heater size and capacity. If you need a large capacity thermal fluid heater, API-style is likely the way to go. The helical coils found in non-API heaters, on the other hand, can be limited in terms of size and capacity for a few reasons. For one thing, the coils typically need to ship as one assembled piece, which means that large capacity heaters are often not possible. Additionally, pipe size, pipe thickness, and bend radius are all factors that may limit the size of the helical coil that cane be achieved, which can then limit the size of the heater that can be manufactured. Serpentine coil heaters typically offer 10 to 15% higher efficiency than hot oil heaters that are designed with helical coils. As a result, API heaters that feature serpentine coils are often more efficient than non-API heaters that feature helical coils. From a service and maintenance standpoint, API-style thermal fluid heaters offer a number of advantages. Their serpentine coils are easier to access and service than the helical coils found in non-API heaters. Additionally, it is possible to replace a tube within a serpentine coil heater, whereas replacing an individual tube within a helical coil heater is typically impossible to do. This means that in non-API heaters, if a tube malfunctions the full coil will need to be replaced. As a result, API-style heaters are typically regarded as the heater option that is easier to maintain and repair when necessary. You can learn more about the maintenance differences between serpentine coil heaters and helical coil heaters here. As mentioned previously, API standards were established to promote safety in the oil and natural gas industries. This means that API-style heaters are constructed to meet rigorous safety standards, which sets them apart from their competitors. If you’re looking to enhance safety within your facility with your next heater installation, an API-style heater is a good way to go. Shopping For an API-Style Thermal Fluid Heater For Your Facility? Many plant managers in this day and age have recognized the value of investing in API thermal fluid heaters. Providing a variety of advantages over the other heaters on the market, API-style heaters tend to come out on top when facilities are weighing their options from a variety of perspectives, including those outlined above. Looking for an API-style heater for your facility? At American Heating Company, we’re proud to offer API-style thermal fluid heaters for a variety of industries and applications. We build our heaters to meet the rigorous API standards, cutting out the significant over-design requirement of true API qualified heaters to provide all the benefits and advantages of API heaters without the additional added cost. If you’re exploring your options when it comes to API thermal fluid heaters, be sure to keep us in mind! Give us a call today at (973) 777-0100 or contact us online to learn more about how our API-style thermal fluid heaters can benefit your facility. Interested in learning more about us? Check out the following resources to learn more about our company and the industrial heating equipment we offer. Advantages of AHC’s Thermal Fluid Heaters – Find out how we set our heaters apart from the competition, and learn about the benefits you can expect when you install one of our heaters in your facility. American Heating Company Customer Testimonials – Read reviews from real customers and find out how our heaters have made a positive difference for their businesses. 10 Reasons to Choose American Heating Company – You have a handful of options when it comes to industrial heating equipment providers. Find out why so many facility managers have chosen us over our competitors.